A woman driving home in Alaska had an amazing wildlife encounter when she spotted a family of lynx crossing the road in front of her. She immediately stops and takes in the sight of the large-pawed wild cats bouncing across the snow and onto the street. “Oh my gosh, in my neighborhood,” she says out loud. But she lets out a startled “what?” when 17 seconds in she looks to her right and sees another one. The surprises keep coming and she can’t believe her eyes when she sees another and then another! “Well, that’s a treat and a half,” she proclaims once the entire family has crossed the road. Lynx inhabit much of Alaska's forested terrain and use a variety of habitats, including spruce and hardwood forests, and both subalpine and successional communities. The best lynx habitat in Alaska occurs where fires or other factors create and maintain a mixture of vegetation types with an abundance of early successional growth. This provides the best habitat for snowshoe hares and other small prey of lynx. Lynx are not present in southern Southeast Alaska, or on the major islands of Southeast (Admiralty, Baranof and Chichagof), and are considered scarce in northern Southeast Alaska. This mirrors the presence of hares. 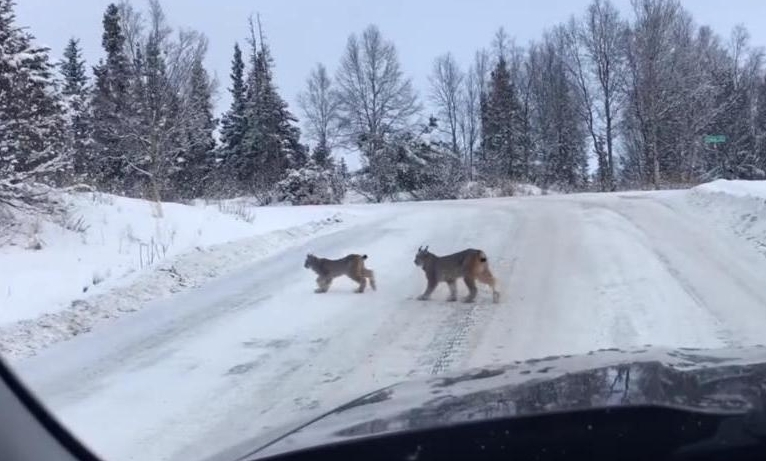 Responses to "Woman Amazed When Three Lynx Cross Road, Shocked When More Keep Coming"